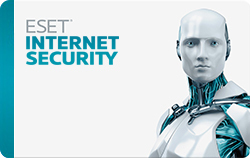 ESET Internet Security offers comprehensive protection using Antivirus, Antispyware, Personal Firewall and Antispam. By the time you finish reading this 70 new variants of malware will have been released. Are you prepared? With ESET Internet Security, that is a question you will never have to ask. ESET Internet Security prevents, detects and removes malware such as adware, bots, rootkits, spyware, trojans, viruses, worms and other Internet threats you face on the job, at home and everywhere your computer goes.